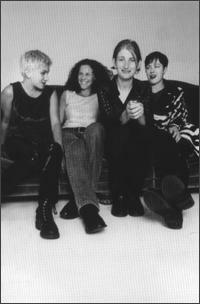 Lenny Rennals joined Juned as their drummer and backup vocalist in 1993, with Claudia Groom & Dale Balenseifen playing dual vocals & guitar, and Leslie Hardy on bass. She had left the army where she had trained as a medic, and decided to move to Seattle in 1991 because of the blossoming music scene, or as she put it “because I wanted to see all the SubPop bands live.” Juned released a 7″, two full-length albums on Sub Pop subsidiary Up Records, contributed to compilations, and toured extensively (including a national tour opening for Dinosaur Jr) before breaking up in 1997. A couple years after Juned broke up, Lenny joined the band The Heroic Trio with Jo Claxton (Welcome, Universe People). They collaborated with a few different bass players including Dan Beloit (The Valley), Martin Bernier (Some Velvet Sidewalk), and Kellie Payne (Universe People). The Heroic Trio put out a cd and a 7″ ep on La Push Records. “When I got pregnant with my daughter and could barely fit behind the drums is when I decided to quit the band,” recalls Lenny. A few years later, after earning her Masters of Social Work degree and adding a son to the family, she played for a short time in the band West Nelson Siding with Larry Biely (Biography of Ferns), Mike Hudson (Aveo) and Tracey Grady. Lenny’s focus has shifted to being a mom. Although she doesn’t play much music right now, she hopes to find the time soon. Lenny lives in Ballard, Seattle with her husband Scott and her two kids.